You’ve watched a bazillion instructional videos of your favorite makeup artists religiously, practiced your emerging skills on anyone who would let you, and you’re 100% positive you could do this for a living. You could become the world’s next top makeup artist. You just need the right makeup art training and an excellent webcam. It’s important to understand the how’s and why’s of makeup and makeup artistry, to truly appreciate its art form, as well as its present-day prominence. Various types of makeup have been around for thousands of years, and its evolution is nothing short of fascinating. Women and men have been enhancing their facial features with products made from copper and lead ore, to powders dusted with arsenic and other such poisons depending on when and where they lived. They’ve even placed leeches on their faces to draw the color out of their faces and smeared blood on their lips to add color. Gross. Consumers of days gone by were lucky if they survived the dire side effects of their makeup, that’s for sure. Back then, many people died in the name of vanity. Seriously. Makeup was a serial killer. The early 1900’s brought with it Max Factor and Westmore, who forever reshaped glamor when they became relevant in Hollywood. Movie stars used makeup even before that, but it would take hours to get them ready for their closeups, using the thick greasepaint products available. These products never seemed to look right on film until the 1930’s. Makeup became readily available to the masses, and the women eagerly swooped them up in an attempt to reproduce the looks of their favorite film stars. Cosmetics and the way they’re used have gone through multiple series of evolution, and will continue to do so as trends in makeup and looks change. But, one thing is for certain, the love of makeup and the fascination with the makeup artists isn’t going away anytime soon. Find a local makeup artist program. Film, TV, and Theatre: Performing actors are usually the clients of this type of makeup artist. The Film, TV, and Theatre makeup artist needs to understand lighting and how it affects the looks of the character actor. Also, Special Effects artistry falls under this category, which is a higher paying, more advanced field. Cosmetic: Cosmetic makeup artists work behind the counter at retail stores demonstrating how to use a particular brand’s makeup. Fashion: Preparing models to walk the runway, as well as applying makeup for head-shots is what a fashion makeup artist does. Their career is very versatile. Personal Care: Very often, a celebrity will hire their own personal makeup artist as part of their entourage. This is a cushy gig. Special Occasion: Weddings, red-carpet or corporate events, the special event makeup artist knows their clients want to stand out dramatically and they aren’t afraid of a smoky eye and bright red lip. Also, mortuary makeup artists fall into this area. They make sure that the deceased looks presentable. Being a makeup artist comes with a mixture of hard work, determination, and play. Yes, you get to play and experiment all day with your favorite thing, makeup! That, in and of itself, is a HUGE perk. But wait, there’s more. Jetsetting: Whether it’s just once in awhile or a constant, many makeup artists get to travel for their job. And most often the expenses are covered. Just imagine traveling the world and leaving beautifully made up faces in your wake. Glitz and glamor: Of course, this depends on where your career takes you. But, working backstage at a fashion show, or an elite award show while rubbing elbows with the famous is pretty darn glitzy and glamorous. Fame: There have been many makeup artists throughout history who have become household names. Think Pat McGrath, Kevin Aucoin, Bobbi Brown and the list could go on to include you! Loads of opportunities: You don’t have to be in the corner of a salon, you can decide where you want to work. Being a makeup artist means you’re your own boss, and you can create your own opportunities. Oh, the people you’ll meet: Presumably you’ll be seeing client after client throughout a day. That’s a broad range of people you’ll get to meet. You’ll get to hear so many different life stories! Keep in mind, makeup artists find themselves among fierce competition. You have to find a way to stand out, whether it’s your work or your personality or a fabulous combination of both. Pat McGrath is the most influential makeup artist of the day, and she didn’t go to school to be a makeup artist so why should you? Well, because she’s an anomaly. Frankly, her entire career is. And one to aspire to. In many states, it's actually a requirement to have a cosmetology license to be working as a makeup artist. And, in the states that it's not a requirement, it's still preferred if you want to find a job in spas or salons. To work as a freelance makeup artist, you just need to do a lot of practicing and portfolio updating. However, there is chatter that much of what’s learned in cosmetology school is antiquated and in serious need of being brought into the 21st Century. With that being said, it’s still recommended to that you go to cosmetology school to learn all aspects of the field, from hair to skin care. Being well-rounded can’t hurt. After you complete an accredited cosmetology program, you’ll take the licensing exam. You’ll need to pass that and most schools help you with the studying aspect of it. Watch tutorials and apply those techniques to your victims..um..friends and family. Research famous makeup artists and find out how they achieved their success, and use that as part of your master plan to dominate and conquer the industry. Keep practicing all your skills. Offer free services to people who are heavily connected. Just keep seeking out opportunities that will give you more experience and exposure. A portfolio goes beyond a resume. You’ll want to have online access, like Instagram and a blog, but you’ll also want to have photographs placed inside a physical portfolio. Because a portfolio is so important to a makeup artist, we will talk more about this in a bit. Freelance or find work in the industry, whether it’s behind a makeup brands counter at the mall, or at a small salon (or a big one, it doesn’t matter!). Advance your skills through classes, seminars, makeup manufacturers, etc. Broaden your network, and market yourself steadily. Curious? Then read a day in the life of a makeup artist. Instead of explaining it, here's a side-by-side comparison highlighting the difference in cosmetology versus makeup artistry. Hair shampoo and style, cut, color, highlights, mani/pedi’s, and skin treatments. A portfolio is your selling tool. You can tell people all day long that you do a mean contouring and cut crease, and your overline is killer. And don’t even with the tightlining because you’re a master. But, most people are skeptical, so you’ll need a way to prove it. Here’s where your portfolio comes in. You can whip out your leather case, unzip it, and pull out glossy photos of friends and clients. Or you can hand them a card with an URL to visit your very own portfolio website. Um, actually, it’s best to have both a portfolio binder of some type along with an online portfolio. You’re an artist, and it's a visual field, so you’ll need to fill your portfolio with a few of your best pieces of work. You’ll need to be able to show off the range of your talent to a potential employer, and that’s what you need to keep in mind when choosing what pictures to include. Models of multiple ethnicities, skin tones, and types, and ages are important to include to show your diverse range of expertise. The Bureau of Labor Statistics reports that the average salary of a makeup artist is just over $70,000. 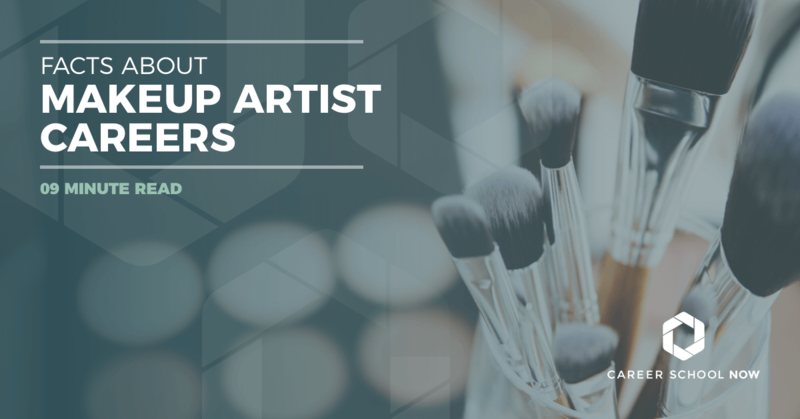 The highest paying industries for makeup artists are movie and film, and performing arts companies. Salaries that have been reported range from in the $20K’s to well over $100K. What your salary will look like will be dependent on which part of the industry you work in, and how well you’re able to sell yourself. States, where makeup artists will make the most money, are D.C, New York, Georgia, California, and Pennsylvania. The employment growth stats available pertain to theatrical and special effect makeup artistry, which is expected to experience tremendous growth through 2024 at 19%. There isn’t any way to determine makeup artists job outlook because so many are freelance and not dependent on the job market. They enjoy a pretty recession-proof career, though. Even when money is tight, many consumers find the finances for small luxuries such as hair and makeup. It’s such a simple thing that gives such tremendous pleasure. Our hair stylists and makeup artists are usually on the top 10 list of personal favorite people. If you're interested in finding out what being a makeup is really like, then check out our expert interview...Career Talk!